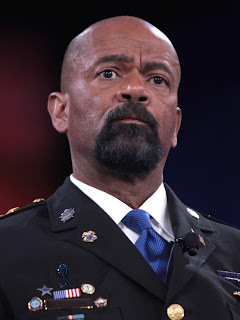 Milwaukee County Sheriff David A. Clarke Jr. said Wednesday he would leave office next month to accept a federal appointment as an assistant secretary in the U.S. Department of Homeland Security. He said he would work in the department's Office of Partnership and Engagement as a liaison with state, local and tribal law enforcement and governments. "I'm looking forward to joining that team," Clarke said Wednesday on Vicki McKenna's radio talk show on WISN-AM (1130). The fourth-term sheriff said he would start the job in June.